Some of the most wanted butterflies to see in Panama are the daggerwings. Superficially looking like swallowtails, these beautiful butterflies belong to the large brushfoot family, Nymphalidae. Daggerwings are medium-sized butterflies recognized by their long pointed tails on the hindwings. Glossy Daggerwing is one of the most beautiful species of the genus. 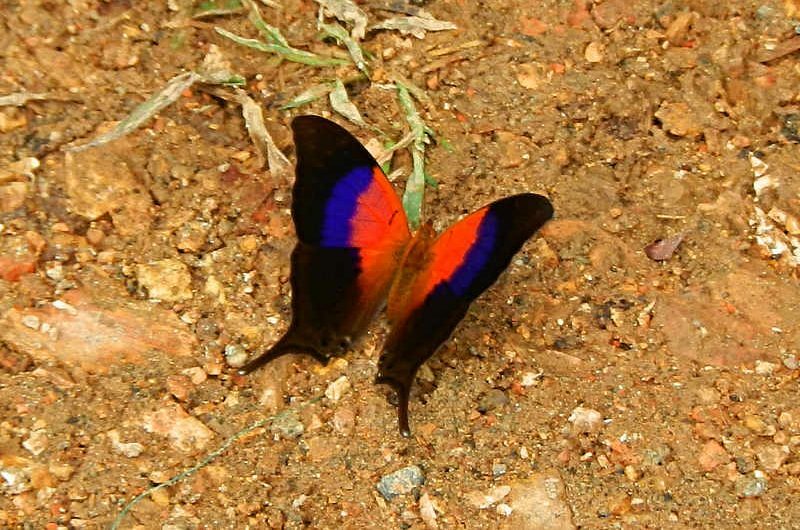 Males are brightly marked with orange & purple near the body with a dark brown border and hindwings, and brown underside with dark wavy lines. Females are brown with a white stripe and spots on the forewing. Females are rarely seen as they prefer to be high in the canopy, whereas males stay close to the ground. Larvae are brightly colored, with a single row of spines down the back and a pair of spines on the head. Their host plants are of the family Moraceae. Daggerwings in general are often found at mud puddles and along riverbanks, forming large aggregates. However, Glossy Daggerwings are solitary and not known to be found in aggregates. This species is found from Nicaragua to Bolivia, from sea level to 1400m. It is fairly common around the Canopy Lodge and especially the Canopy Camp.